Once considered a rite of passage from adolescence to adulthood, experts now believe binge drinking can cause serious brain damage. 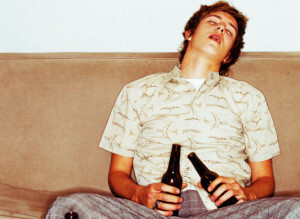 Binge drinking, or heavy episodic drinking, has typically been explained as a behavior in which adolescents act out their independence. In the new study, researcher Tim McQueeny studied high-resolution brains scans on a sample of 29 weekend binge drinkers, aged 18 to 25. He discovered that binge drinking — consuming four or more drinks in one incident for females and five or more drinks for males — was linked to cortical thinning of the pre-frontal cortex, the section of the brain related to executive functioning such as paying attention, planning and making decisions, processing emotions and controlling impulses leading to irrational behavior. McQueeny, a doctoral candidate in psychology at theUniversityofCincinnati, examined the brain’s gray matter, the parts of brain cells that do the thinking, receiving and transmitting of messages. “We have seen evidence that binge drinking is associated with reduced integrity in the white matter, the brain’s highways that communicate neuron messaging, but alcohol may affect the gray matter differently than the white matter,” he said. McQueeny wanted to discover if the drinking episodes altered the thickness of gray matter among college-age young adults. He discovered that as the number of drinks went up, cortical thinning occurred. He is now interested in pursuing future research to examine whether binge drinking is affecting the brain’s gray matter and white matter differently, or if they’re both equally affected. “Alcohol might be neurotoxic to the neuron cells, or, since the brain is developing in one’s 20s, it could be interacting with developmental factors and possibly altering the ways in which the brain is still growing,” he says. Binge drinking is not an isolated phenomena, as a publication from the National Institute on Drug Abuse reports that 42 percent of young American adults between 18 and 25 have engaged in binge drinking. McQueeny said that the depressant effects of alcohol emerge later in life, so for young adults, the effect of alcohol can be very stimulating and activate tolerance over time. “In the past, in terms of what’s known about the physical toll of alcohol, the focus on neurobiology has been in pathological populations and adult populations who were disproportionately male, so there was a significant gap in research in terms of when people started risky drinking. We’re looking at developmental aspects at an age when binge drinking rates are highest, and we’re also looking at gender effects,” said McQueeny. In terms of educating young adults about responsible drinking,Medinasaid there appear to be better efforts about communicating the dangers of drinking and driving. “However, people can still be doing damage to their brain as a result of the prevalence and acceptance of binge drinking. There is also evidence that drinking below the binge level may be less harmful,” she said.